In May, 2017, the U.S. House of Representatives passed the Working Families Flexibility Act (HR 1180), which would provide compensatory time for employees in the private sector. In lieu of overtime pay, employees could receive compensatory time off for which overtime pay would otherwise have been required. The bill is currently being reviewed by the Senate. The bill is silent and does not take any steps to increase the number of workers who are entitled to overtime pay. The bill amends the Fair Labor Standards Act of 1938 (“FLSA”) to authorize employers to provide compensatory time off to private employees at a rate of not less than 1 ½ hours for each hour of employment to which overtime compensation is required, but only if it is in accordance with an applicable collective bargaining agreement or, in the absence of such an agreement, an agreement between the employer and employee. Currently, the FLSA does not permit “comp time” in lieu of overtime pay. Thus, under the bill, private sector employees would be allowed to exchange their overtime pay for future paid time off. If an employee later changes his or her mind and decides to take the overtime pay, the employer will be required to “cash out” and pay the sum within 30 days. Furthermore, before January 1st of each year, employers must provide monetary compensation to employees for any unused comp time that was accrued, but not used during the prior year. The bill also includes language that prohibits employers from either indirectly or directly intimidating, threatening, or coercing an employee into exchanging overtime pay for comp pay. Employers who fail to comply with these rules will be required to pay the employee twice as much for each hour of comp time accrued. Opponents of the bill argue that the law does not do enough to protect workers. For instance, some opponents have stated that the law incentivizes employers to give overtime hours to workers who choose to take comp time over employees who would prefer overtime pay. Furthermore, in order to receive comp pay, employees must provide their employer with reasonable notice, which is not often possible. The law also permits employers to discontinue the policy at any time as long as they give employees a 30 day notice. Employers are also given the right to pay an employee’s unused comp time if he or she has accrued more than 80 hours, at any time, although a 30 day notice is still required. The exchange option is also not available to all employees who, in order to opt into receiving comp pay, must have worked at least 1,000 hours for the employer during a period of continuous employment in the previous year. In fact, the law does not require employers to offer the exchange as an option at all. Instead, each employer is given the choice of whether or not to implement the program. Finally, the law prohibits employees from accruing more than 160 hours of compensatory time. 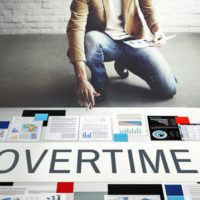 The new law could have a substantial impact on how overtime pay is accrued and compensated across the country, so if you have questions about how the law could affect you, please contact an experienced overtime violation attorney at Saady & Saxe, P.A. Attorneys At Law by calling 813-909-8855 or by completing and submitting one of our brief contact forms. We are eager to help you today.